One of the great things about the Bard is the outstanding people you have contact with while researching or writing about him. Ian MacMillan certainly is no exception. He has written earlier for this space and it is good to see his curiosity and expertise on Robert Burns once again. You will find this article a wee different from most in that he actually walks you through the steps to find the information on the diamond stylus in the Rozelle Museum. The following was sent to me in the form of an email and I have left it that way on purpose. Have fun, I did! My article in the Robert Burns Federation’s 2006 Spring Chronicle about Rabbie’s 22 day Highland tour in 1787 prompted a number of queries from Burns enthusiasts. One point questioned was a reference I made to Burns using a diamond stylus, presented to him by the Earl of Glencairn , to write his version of graffiti on various window panes. 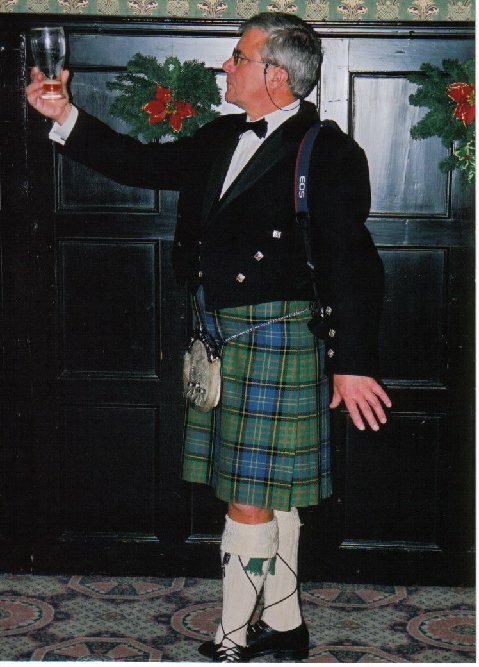 This has been referred to in a number of books but the specific reference I quoted was taken from Dr. John Cairney’s ’ On The Trail of Robert Burns’ published by Luath Press Ltd., first in 2000. The query was whether Burns used a diamond ring, as some works state, or a pen /stylus, and does the object still exist and if so where? That set me off on a search, the kind of mission that I am sure is very familiar to Burnsians, to answer and hopefully find this holy grail. I e-mailed and telephoned quite a number of experts in the ’Burns World’ and had a reply from all of them including Dr Cairney but none knew the answer. Then, followed a fascinating visit to Ellisland Farm where the curator, Les Byers, was very generous with his time and expertise. (By the way I would recommend a visit to any Burns enthusiast. Les has a treasure trove of knowledge which he is only to keen to share.) He was sure that it was a stylus and thought it was in a museum, perhaps the Royal Museum in Edinburgh. I tried there, the Mitchell in Glasgow and Alloway without success. pointed me to a reference about articles in the Rozelle museum in Alloway, just up the road from Burns Cottage. There, I not only hope to have found my grail but have held the stylus, albeit with white protective gloves which I am sure Rabbie was not required to don. Accession No AYRTOS 100346 is part of the collections from the former Tam O’Shanter Museum in Ayr, currently under the care of South Ayrshire Council. Research is required into the provenance and ownership of these collections, some of which were on loan from private collectors. My own opinion, for what it is worth, tallies with others including Dr. Cairney, that Robert Burns did use a stylus to write so neatly. I, of course, have no proof that this was the actual object he used rather than one of the facsimiles that have appeared but, unless anyone comes up with a better idea, I will claim that I have found and held my grail. I will also look forward with interest to what Rozelle manage to unearth about ownership and provenance. Many thanks to all those who helped me in my search including Dr John Cairney, Peter Westwood, John Manson of the Alloway Museum and in particular to Les Byers, James and of course Elinor from Rozelle. 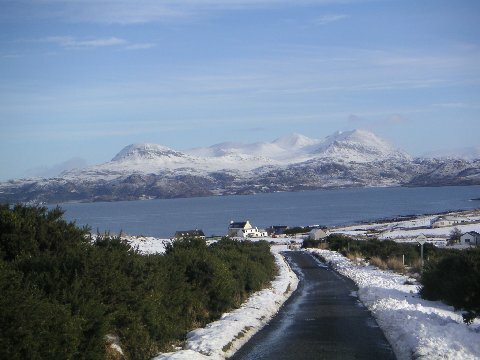 Both photies are of Gruinard bay in Wester Ross. The first looks South to the mountain range that climbers here hold second in attractiveness/challenge to the Cuillans in Skye - its name is An Tealloch - Gaelic for the anvil/forge. 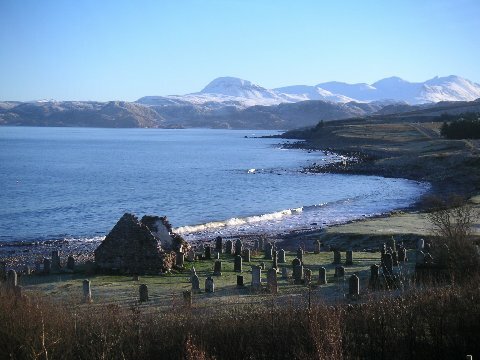 The second is of the very old graveyard below our home, - Fernbank, in Laide, Wester Ross - It is thought there may be a Christian history to this site going back to St. Columba's time in the 7th century.